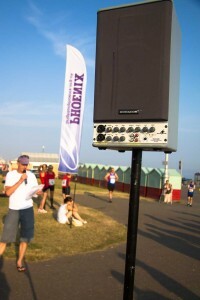 We have eight rechargeable portable PAs, suitable for meetings and small outdoor events. Use the table below to see which one will be best for your event. One wireless mic; plus an optional mic with a lead if you have more than one person speaking. You can attach these two PAs together, which is helpful if you have a big space to fill, because you can have sound coming out from two different speakers. You can then use up to three microphones at one time. Ask for PA 1 or 2. USB/SD card slots to play MP3 music files. The battery life is shorter than the other PAs – it lasts a minimum of 2 hours. This PA is cheaper to hire than the others. You can attach additional speakers to any of the PAs. If you need to transport the PA without a car, you will need to hire PA3 or PA5.